Summary: We present a unique case of a patient with a symptomatic carotid cavernous fistula treated successfully with balloon embolization. Her subsequent death from other disease processes allowed direct visualization of the balloon occlusion in situ at postmortem examination. The treatment of symptomatic direct high-flow carotid cavernous fistulas by detachable balloon embolotherapy is an established and accepted treatment (1–4). Fistula closure prevents high-pressure arterial blood from entering the low-pressure cavernous sinus. Once closure of the fistula is achieved, the associated symptoms regress rapidly. 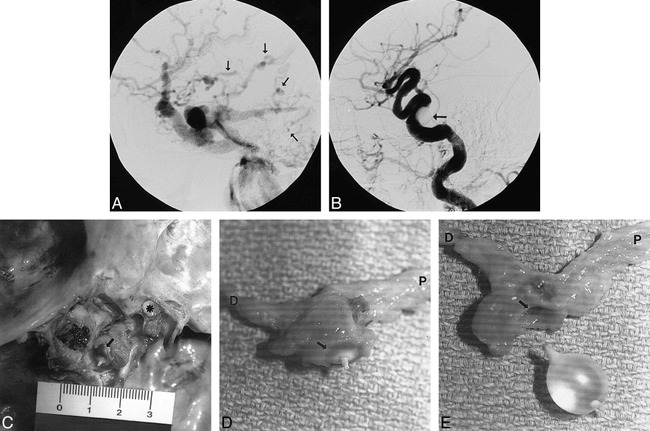 Numerous studies have established the efficacy of intraarterial balloon therapy (1–5); however, we are unaware of any reports of direct visualization of balloon occlusion in situ. A 41-year-old woman was admitted to a local hospital with sudden onset of neck pain and stiffness, and a sensation of blood rushing in her ears. Her Glasgow Coma Scale (GCS) score was 14. Physical examination showed no focal neurologic deficits; however, a right frontal bruit was evident on auscultation. A CT scan at this time revealed intraventricular and subarachnoid hemorrhage, and cerebral angiography showed a direct, high-flow right carotid cavernous fistula (Fig 1A). There was significant ipsilateral retrograde pial venous drainage from the cavernous sinus, which was believed to be the cause of hemorrhage. Soon after angiography, the patient's neurologic status deteriorated suddenly and a repeat CT scan confirmed an increase in intraventricular and subarachnoid blood, prompting referral for urgent embolization. At this time, she was somnolent with a GCS score of 12, a disconjugate gaze, equal and reactive pupils, and a mild left pronator drift. 41-year-old woman with sudden onset of neck pain and stiffness, and a sensation of blood rushing in her ears. A, Right internal carotid arteriogram, lateral view, late arterial phase, shows a large, direct carotid-cavernous fistula with rapid filling of the right cavernous, superior, and inferior petrosal sinuses and numerous pial cerebral veins (arrows). B, Right common carotid arteriogram, lateral view, after embolization shows the fistula has been closed by one detachable latex balloon (arrow) with restoration of normal arterial blood flow. C, Gross dissection of the base of the skull and right cavernous sinus with posterior clinoid processes removed and left cavernous sinus exposed. Note the right optic nerve (asterisk). The proximal balloon tip is visible through the carotid defect (arrow). D, Right cavernous carotid artery with balloon in situ (arrow on carotid defect rim). Note the proximal petrous internal carotid artery (P) and the distal supraclinoid internal carotid artery (D). E, With balloon removed, the vessel defect can be seen (arrow on carotid defect rim). Note the petrous (P) and supraclinoid (D) segments of the internal carotid artery. Also note that the proximal, valve end of the balloon protrudes through the defect and the distal end protrudes into the parent internal carotid artery. The patient's medical history included aortic and mitral valve repairs in 1982 and 1990 as well as an abdominal aortic aneurysm repair 1 month prior to presentation. She had an unclassified connective tissue disorder and her son had been found to have Marfan syndrome. On the morning of her second hemorrhage, the patient was taken to the angiography suite for treatment. A 7F guide catheter was placed into the right internal carotid artery through a right groin puncture. A detachable #9 Goldvalve (Nycomed, Paris, France) balloon placed on a 2F microcatheter was advanced via the guide catheter and flow-directed to the site of the fistula. The balloon easily entered the opening of the cavernous carotid fistula and was inflated. Angiography showed complete occlusion of the fistula with restoration of normal internal carotid flow distally (Fig 1B). The balloon was detached uneventfully. Monitoring was carried out in the intensive care unit, and over the next few hours the patient's neurologic status improved with only a slight left pronator drift remaining. The following day, she reported vague, diffuse abdominal pain, and within minutes she suffered cardiac arrest, which was unresponsive to vigorous resuscitation attempts. At autopsy, the peritoneal cavity contained 2.8 L of fresh blood, the result of a ruptured, dissecting abdominal aortic aneurysm located just distal to the intact aortic repair. Multiple small acute and chronic intimal tears were identified near the site of dissection. On examination of the brain, subarachnoid blood was found predominantly in the basal cisterns and inferior aspects of the frontal and temporal lobes. The vessels of the circle of Willis were remarkably thin-walled, flaccid, and translucent. The right cavernous sinus was opened to inspect the cavernous internal carotid artery. A smooth-edged defect was found along the posterior aspect of the vessel, which was completely occluded by the detachable balloon (Fig 1C–E). Microscopy at this site showed a thin-walled aneurysm with a deficient internal elastic lamina and muscularis media. Intraparenchymal and subarachnoid hemorrhage from direct carotid cavernous fistulas, secondary to pial venous hypertension from shunted arterial pressure blood, is a well-recognized clinical entity (1, 2, 6). The presence of pial (cortical) venous drainage is an indication for urgent endovascular therapy (6). Closure of the arterial-to-venous communication at the cavernous sinus level reverses cerebral venous hypertension and eliminates the risk of further hemorrhage. This patient presented with subarachnoid and intraparenchymal hemorrhage as a consequence of a direct carotid cavernous fistula from cavernous internal carotid artery aneurysm rupture. At autopsy, there was no evidence that the rupture site communicated with the subarachnoid space. Rupture of cavernous internal carotid artery aneurysms with subarachnoid hemorrhage is exceedingly rare (7). Rupture of a cavernous aneurysm into the sinus with development of a direct carotid-cavernous fistula may occur more frequently; and, in our case, cortical venous drainage led to cerebral venous hypertension and resultant hemorrhage. Balloon embolization was easily accomplished, with normalization of internal carotid flow and reversal of the pial venous hypertension. This was accompanied by improvement in the patient's neurologic status. Her death the day after the procedure was caused by an acute rupture of a dissecting abdominal aortic aneurysm. She had had numerous prior vascular surgeries, which may have been related to an unclassified connective tissue disorder. The patient did not have the morphologic phenotype of Marfan syndrome, but this disorder had been recently diagnosed in her son. Numerous articles have reported an association between connective tissue disorders and carotid cavernous fistulas (8–10). As expected, a ruptured aneurysm was found in the cavernous internal carotid artery at autopsy. The balloon was found within the residual aneurysm and extended beyond the ruptured dome and protruded into the cavernous sinus. The balloon conformed to the thin-walled aneurysm, with complete occlusion. It was surprising at postmortem to see that it was actually the proximal, valve end of the balloon that occluded the fistula, and that the distal end was within the parent vessel. The sudden death of this patient from remote but presumably related disease was unfortunate; however, it offered an unusual opportunity to visualize directly balloon occlusion of a carotid cavernous fistula in situ. ↵1 Address reprint requests to David M. Pelz, MD, FRCPC, Department of Radiology, London Health Sciences Centre, University Campus, The University of Western Ontario, 339 Windermere Rd, Box 5339, London, Ontario, Canada N6A 5A5.